Sakisaka has a rather odd looking avatar. He is a very tall man of indeterminate age dressed in dark green leather armor. He wears a short brown cape and carries a round shield on his back. 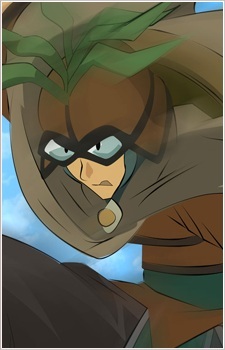 His face is the most distinctive part of his character, he wears an onion shaped helmet with goggles. Depending on his mood the goggles can flash different words or symbols at his command. When fighting, he summons a green bayonet, which he wields as a sword. Unlike most characters, he does not appear to have a visible wave symbol on his body or clothing. Sakisaka has an interesting personality, he is very fond of using puns and other word games in everyday speech. He is generally a friendly helpful person, but he can also be very jealous and shows signs of having a bit of a temper. To those he considers friends he is one of the most helpful people you could meet, but to people who have offended him he is almost impossibly disagreeable. He is closest to Tabby who considers him her role model. In the real world Sakisaka is a 19 year old man named Shinnosuke Sakamuki. He mentioned once that he lived in a cramped apartment with few windows.